February is such a controversial month for me. We have a little bit of winter and a little bit of spring during this short month. The little bits of springlike weather sends me outdoors with hopes of never having to bundle up inside again. However, that is usually not the case. The very next day could bring snow, or thunderstorms, or a bright, sunny, cold day. Nonetheless, those few warm days have me outside looking for the green things! You know, those things that are not perpetually green. Not an easy task at this time, but not a total bust either. Lurking around in my yard and flower gardens are a few green sprigs of ground ivy. Ground ivy is very plentiful in our region (West Ky.) and I am a believer in using what you have close to you, if you can. 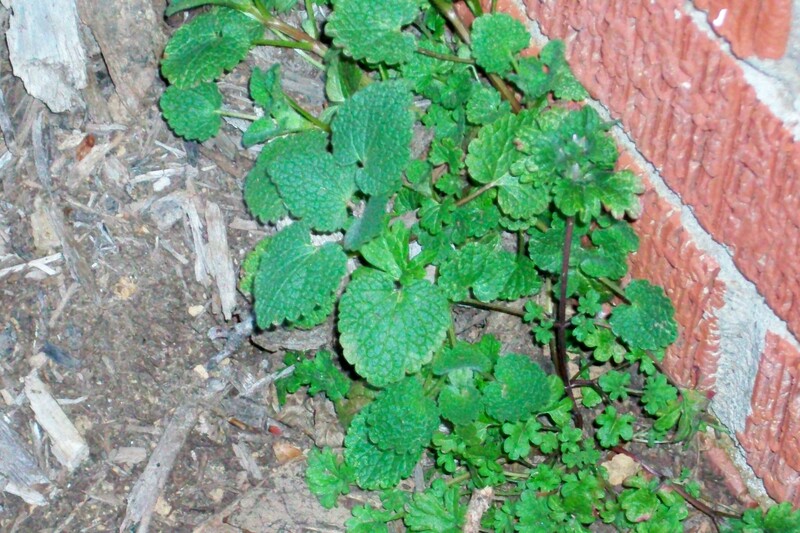 This little plant in the mint family is scientifically known as, Glechoma hederacea L., can be a lovely and healthful addition to your medicinal and herbal eats. Although, those who don’t know any better will call this lovely little plant a weed, possibly even a nuisance to their garden. Ah, well, we do know better, right?! Medicinal uses for ground ivy, sometimes referred to as ‘creeping charlie’, include tinnitis, hearing loss, lymphatic issues, arthritic ailments, and mouth sores. It can be eaten in salads or made into a tea or infusion. For mouth sores, it makes a fantastic healing gargle. When harvesting your own ground ivy for medicinal or culinary use, harvest from your lawn or garden where no pesticides are used. Avoid harvesting too close to your home or other structures. The plant grows close to the ground and has rather heart shaped leaves. In the spring and throughout the summer months it blooms with light to deep blueish-purple blooms. For best results, harvest on a sunny day. Magickal uses for ground ivy include protection against sorcery, promoting sleep, and serenity. Ostara, sometimes Eostara, is the Celtic goddess of springtime. She is celebrated at the spring equinox as a bringer of light and fertility. Calling upon Ostara this week will help in new ventures and fruitfulness. If you are trying to conceive a child, this is the perfect time. If you are involved in an adoption, this week could be very favorable for positive outcomes. Business ventures will certainly be successful this week, especially new ones. For your new ideas and projects, try starting them at the end of the week. With Saturday’s new moon and the influence of Ostara, this will be the perfect day start fresh. Now is also a great time to make some big life changes that you have been mulling over in your thoughts. The lovely goddess, Ostara inspires us to brighten up our wardrobes and lighten up our foods. Time to transition from the heavy, comfort foods of winter to the lighter, healthier fare of springtime. Here in West Kentucky, we have had a few days of beautiful, spring-like weather. These warm, sunny days certainly do spark new ideas. My husband and I have been redoing our deck and planning the vegetable garden. It feels so nice to be outside after such a long and dreary winter. I do hope that your week is filled with sunshine and inspiration.